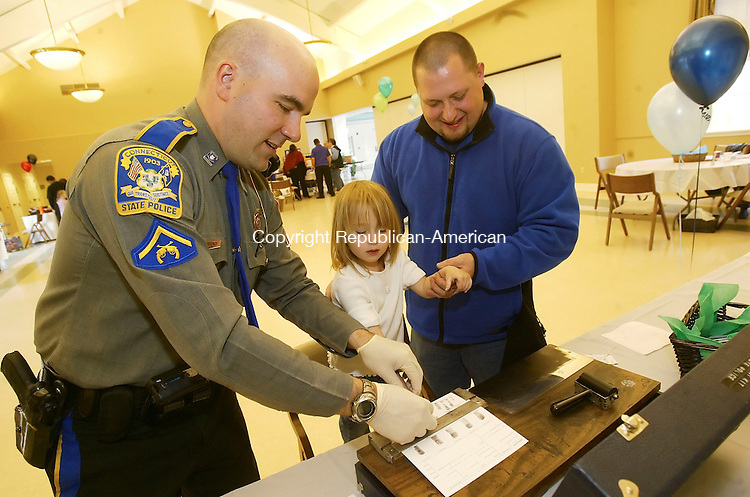 SOUTHBURY, CT 4/14/07- 041407BZ14- Connecticut State Trooper First Class John Moreno fingerprints Lilliana Spagnoletti, 3, of Oakville, as her father David Spagnoletti, helps during the 1st annual recruitment expo sponsored by the Foster Adoptive Mission (FAM) at Sacred Heart Church in Southbury Saturday. FAM is a federally-funded colllaborative of regional organization dedicated to placing children in safe, nurturing homes in Northwest Connecticut. The fingerprints were given to the parents to keep on file in case of emergency.